NT Live has already shown that cinema audiences and actors can benefit from the immediacy offered by a live broadcast of a theatre production. There are no second takes: the performance that worldwide audiences are seeing is the one given right here, right now. Now TV is reclaiming the territory that was its own before the era of the pre-record, following the US lead by creating a TV version of a stage show broadcast live. After NBC’s 2013 TV version of The Sound of Music, ITV has followed suit with the same show. The first question is: Why? There’s a perfectly good film version available already, filmed on location, that won five Oscars including best picture and best director, and became the highest ever grossing film at the time. That beloved classic is a tough act to follow, but to up the ante by staging it on an east London soundstage makes the task nearly impossible. It’s a big enough feat just to get through it, albeit liberally broken by commercial breaks when they can re-marshal their forces – something that wouldn’t happen in the theatre. The saddest thing about this TV version is how flat, lifeless and resolutely unrealistic it mostly feels. 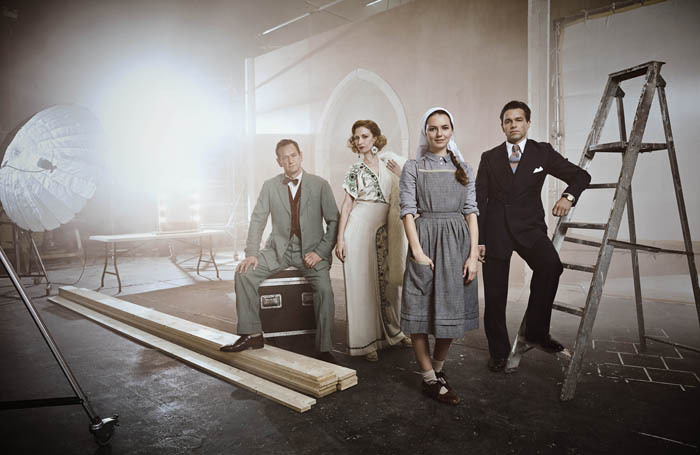 There’s the occasional moment of honesty and truth, notably in a rousing interpretation of Climb Ev’ry Mountain from Maria Friedman’s bespectacled Mother Abbess, and when Julian Ovenden’s Captain von Trapp and Kara Tointon as Maria, fall in love and tenderly sing ‘Something Good’ to each other. We already knew that Friedman and Ovenden can sing, but it’s a lovely surprise to hear Tointon’s warm, clear tones, too. Both those scenes, tellingly, are performed with stillness and clarity. Elsewhere, cameras seem to be forever rushing after the actors or swooping in on them from above on sets that feel as if they’ve been salvaged from some 60s touring production of the show. (There’s a far more beautifully designed production playing at Salford’s Lowry for Christmas). The blocking and choreography are uninspired and sometimes insipid, too. Given the lack of direction, it is to the credit of actors such as Katherine Kelly and Alexander Armstrong that they make an impression nonetheless. At the end of every ad break we got a burst of Queen’s “It’s a kind of magic,” before the show resumed. If only it delivered on that promise.